Store & Displays up to 70 digital Photos. 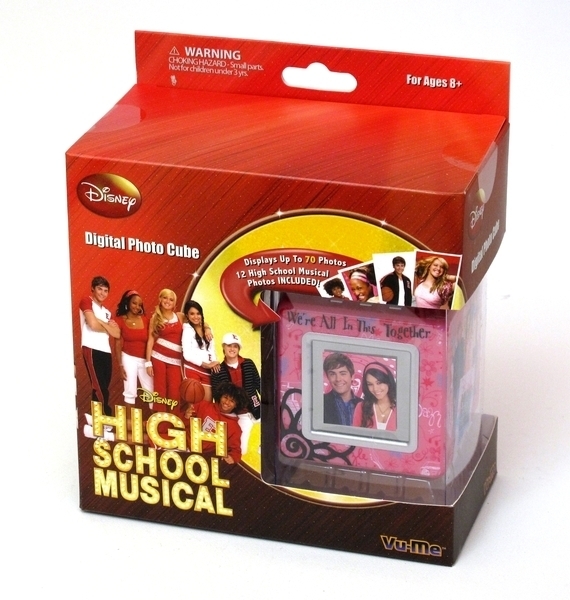 Includes 10 photos of Disney's High School Musical. Easy to use software helps you find and upload your photos. Full Color 1.5 Inch LCD Screen. High Speed USB 1.1 Connection. Includes USB cable. Compatible: Windows 2000, Windows XP & Windows Vista. Includes: Software and USB Cable. Requires: 2 x AAA batteries not included. Size: 2.75" h x 2.75" w x 2.75" l. Warning: Choking Hazard - Small Parts. Not for children under 3 years.